I've Made All Of These! row 5: coy fish, rooster, seahorse, dolphin, dahlia, star, tulip, flamingo, camel, peacock. row 6: spider, pigeon, flapping crane, turtle. (sorry its blurry/far away! It's hard to fit all those in one picture! Comments for I've Made All Of These! If you want a list of the cons of online education, really all you need to do is look at the pros list for traditional education. Online education most likely won't give you these benefits. It also has limited career options. It was a really fun to read articles on this blog. Astonishing a truly embrace data and i look forward however others. I got data about the essaygeek servicefor my task and I figured out how to get it great. You have composed the article in opportune time as I was searching for some data for me. You are a talented and creative person. I want to appreciate your skills and creativity. 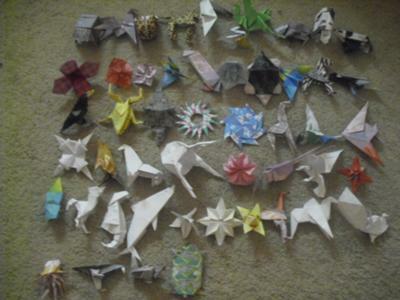 Origami is an old technique of paper art. I would love to learn making some of these animals to impress my kids. Thanks for tutorial videos, they will help. Learn more about resume writing from online sources. I could find a great paper art work here. Congratulation for preparing those work and your mind. Passion required to do any work. Some students are not interested to writing their assignment works. In that case they will use college essay writing service. Most services are providing high ranked paper. Everyone can fun there because it is purity of life and if you can get essay from here http://www.bestessayservicereviews.com/ then it will more creative idea get about fun. IT IS SO COOL! U nearly made all the animals in just one week! If I made them all it would have taken one whole year and they are so cute. Cause Im an expert in animals keep up the good work! incredible! you must have given up a lot of time to make all of these. Could you have made some more?